A parking lot that was transformed into an urban beach park, an industrial area that was converted to a public green space, an underutilized stretch of land along the water’s edge that became a French-style allée — what do these three Waterfront Toronto projects have in common? They’re all conveniently close to AQUABELLA at Bayside, a luxury condominium by Tridel and Hines at Queen’s Quay East. The neighbourhood has undergone significant changes in the past 10 years, and the addition of AQUABELLA will make it even more desirable. The revitalization effort kicked off in 2005, with the proposal for Corus Quay — an eight-storey commercial office tower that now serves as Corus Entertainment’s Toronto headquarters. By 2012, George Brown College had moved in, constructing a new health sciences building that brought further activity to East Bayfront. 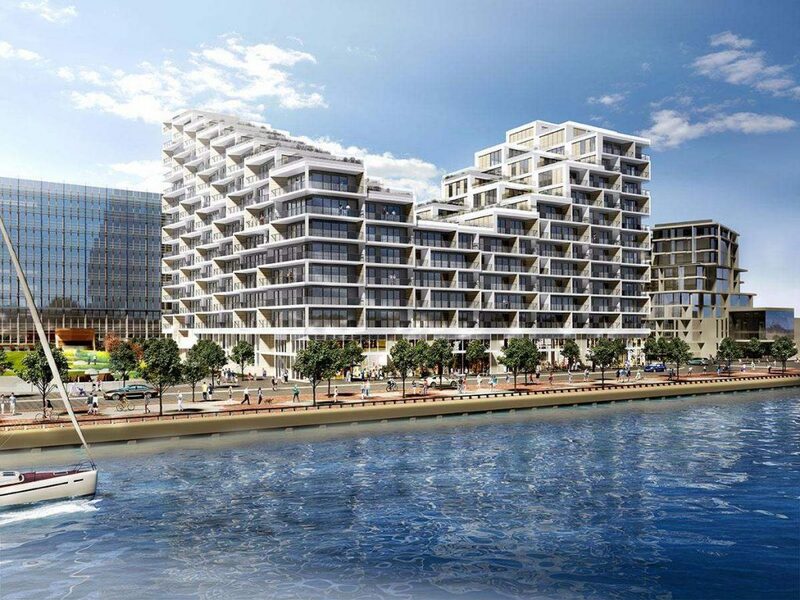 Waterfront Toronto’s public projects in the area have gained international acclaim. 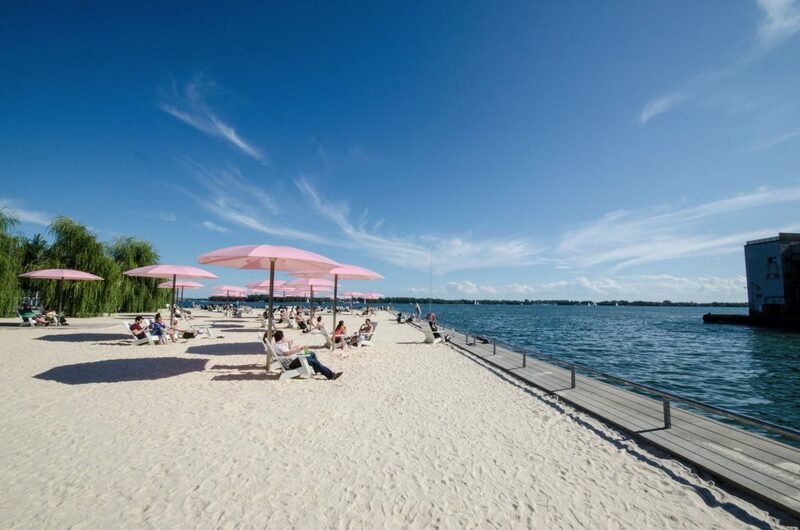 Canada’s Sugar Beach opened in 2010 as a playful waterfront destination, featuring an urban beach with pink umbrellas and Muskoka chairs, a plaza space for outdoor events and a tree-lined promenade that runs diagonally through the park. During the warmer months, you’ll often find office workers sunbathing during their lunch breaks, or children running through the maple leaf-shaped splash pad. The Water’s Edge Promenade was constructed in tandem with Sugar Beach. Thirty metres of public space was added along the length of East Bayfront, turning concrete into a wide granite mosaic promenade and an 11-metre wide wooden boardwalk. The promenade is shielded by mature trees, while the boardwalk is open to the elements and provides a spectacular view of Lake Ontario. If you follow the Water’s Edge Promenade from Sugar Beach, you’ll find yourself at Sherbourne Common, which opened in 2011. 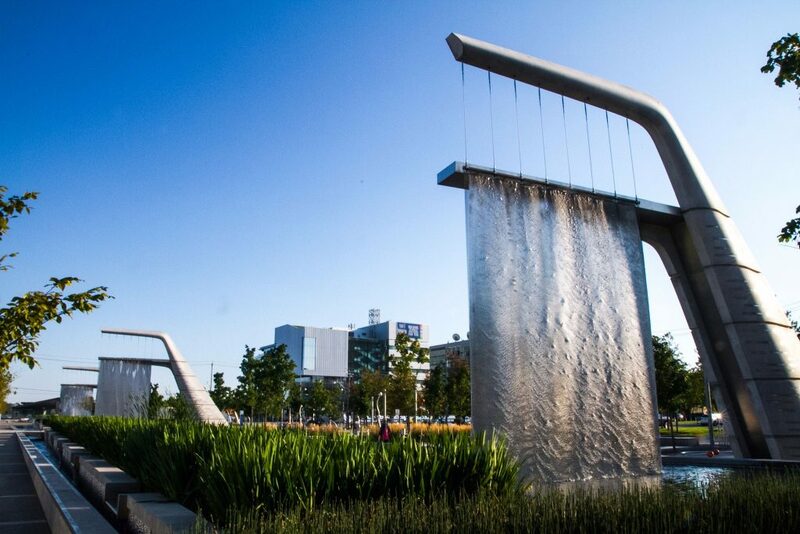 The 1.5 hectare park was designed by renowned landscape architects Phillips Farevaag Smallenberg, and boasts a sprawling green lawn, a skating rink that doubles as a splash pad in the summer, a multi-purpose pavilion and a water channel with illuminated sculptures. All of these East Bayfront attractions are within a short walk of AQUABELLA at Bayside. The 12-storey residence features a stepped, L-shaped design by Danish architecture firm 3XN. 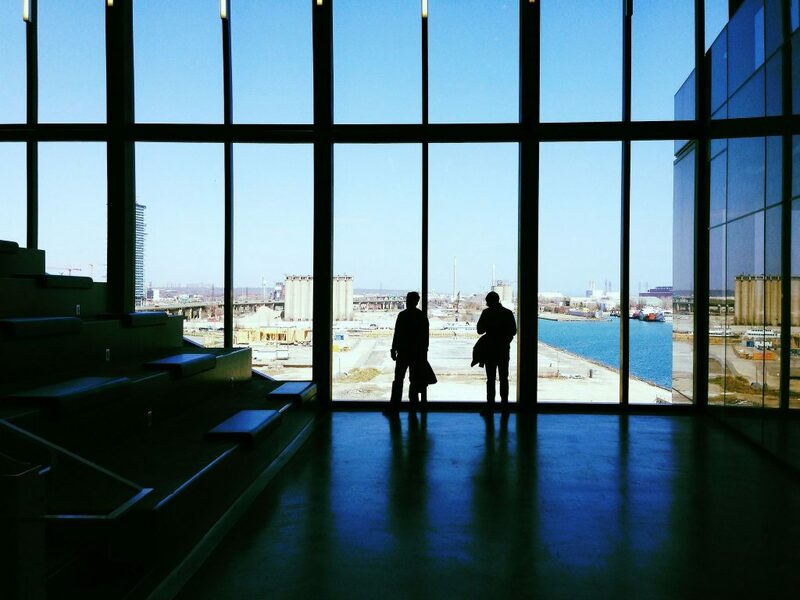 The building’s unique silhouette allows for ample natural light and sweeping views of the city and lake. The one to three bedroom suites boast contemporary, full height flat panel kitchen cabinets, stainless steel appliances, granite or quartz kitchen countertops, premium engineered plank laminate flooring and smooth ceilings. 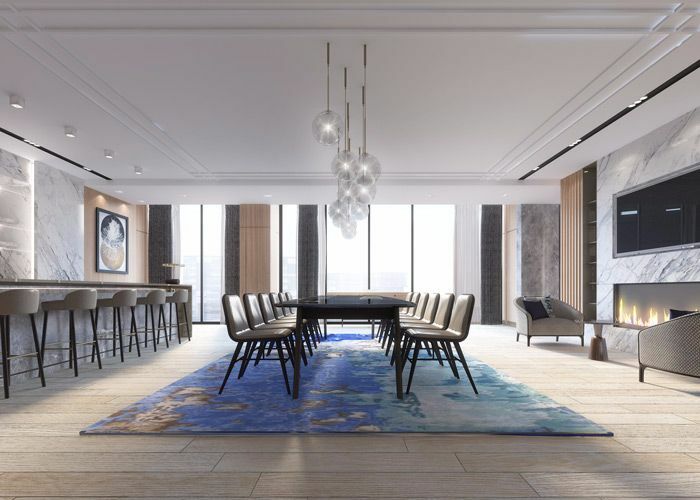 AQUABELLA’s resort-inspired amenities include a seventh floor rooftop terrace with a swimming pool, stylish cabanas, and an impressive party room with a dining room, wet bar and lounge seating. The fitness centre is outfitted with cardio machines, weight training equipment, dedicated spinning and yoga studios, and a rejuvenating sauna. Across from the gym is a private theatre room with a crystal-clear big screen and high-end sound system. AQUABELLA also features not one, but two distinctive lobbies with modern furnishings and art installations. Sales are underway at the AQUABELLA Presentation Centre, located at 261 Queen’s Quay East. Opening hours are Monday to Thursday from 11am to 7pm and on weekends and holidays from noon to 6pm.